Another misty morning, and an unusual hotel breakfast combination of Chinese dumplings and Scotch pancakes with maple syrup but equally tasty. Leaving our hotel we called in to the nearby Java Street market, a large indoor wet market over three floors selling fish, meat, fruit vegetables and flowers. The fish market was the most interesting as live fish swim in aerated tanks and early morning shoppers were busily selecting their catch of the day ready for the fishmonger to prepare. Crossing the road to the North Point ferry pier we caught the New World Ferry across the bay to Kowloon City, the journey taking around 15 minutes and providing us with good views of our hotel looking back towards Hong Kong Island. From the ferry pier bus station we then caught a bus towards the Kowloon Walled City Park, the nearest stop being close to the Holy Family Primary School so our offline phone map came in useful working out where we were. The park was an ungoverned densely populated settlement in Kowloon City. Originally a Chinese military fort, the Walled City became an enclave after the New Territories were leased to Britain by the Chinese in 1898 and at one point up to 33,000 people resided in its 6.4 acres. An eviction programme began in 1993 with demolition taking place two years later. The Walled City Park opened in 1995 retaining some historical artefacts and remnants of the South Gate. It’s a peaceful open space and we certainly enjoyed our short visit. By mid morning the sun had come out, burning off the low lying mist. Unfortunately I’d left my sunglasses in the hotel but just about managed the bright sunlight without squinting too much. 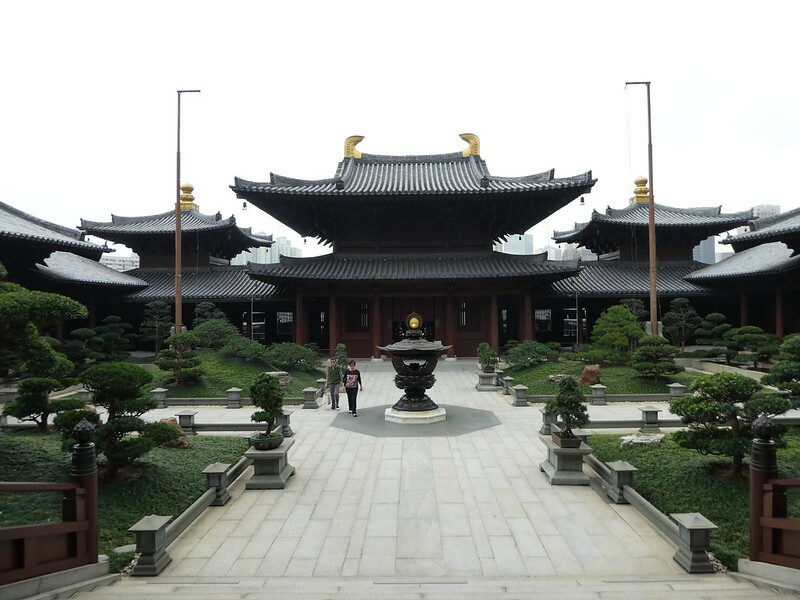 Near the Walled City Garden lies the Hau Wong Temple so we took a look inside. Visitors are welcome in all temples but we always try to be respectful by not disturbing anyone. 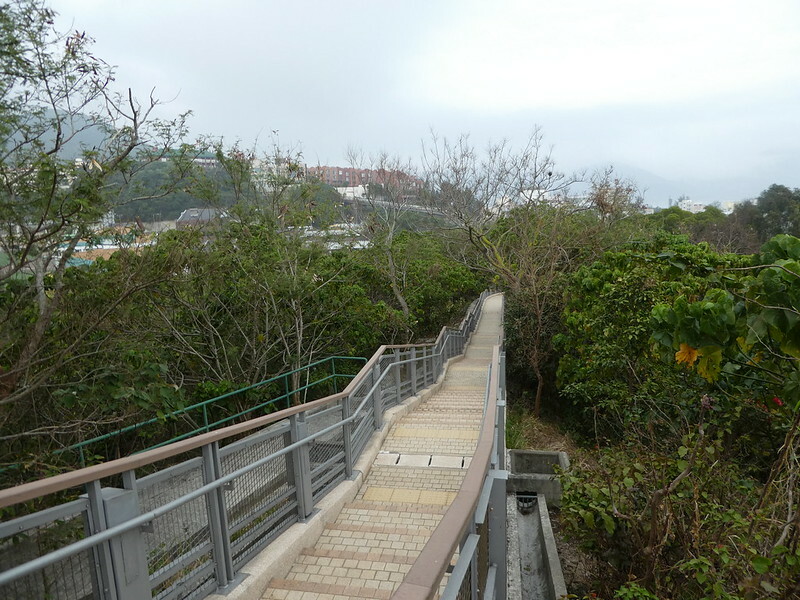 An uphill walk followed to the nearest MTR station where we alighted at Diamond Hill. The modern Plaza Hollywood Mall is located here so we popped in for cool drinks and a little look around before crossing the road to visit both Nan Lian Gardens and the Chi Lin Nunnery. 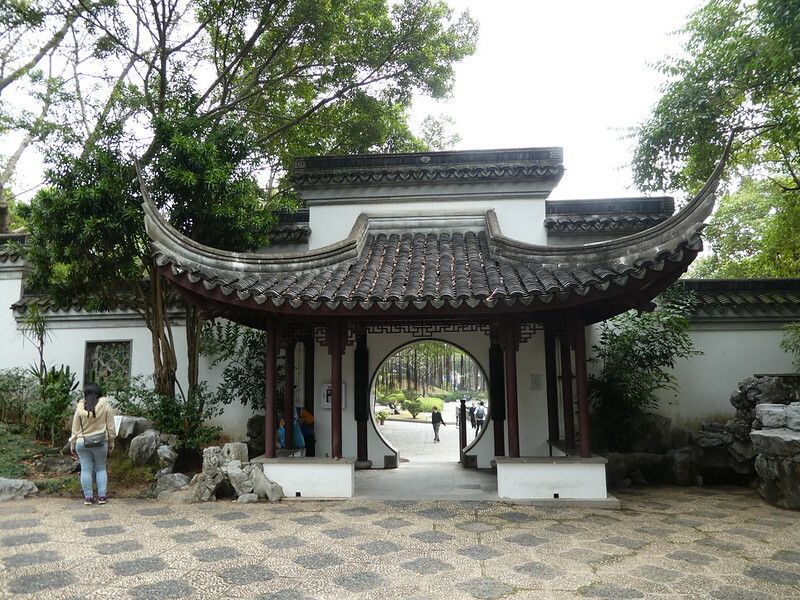 The gardens designed in Tang Dynasty style with ornate pavilions and water features were a joint project of the Nunnery and the Hong Kong government, both opening in 2006. 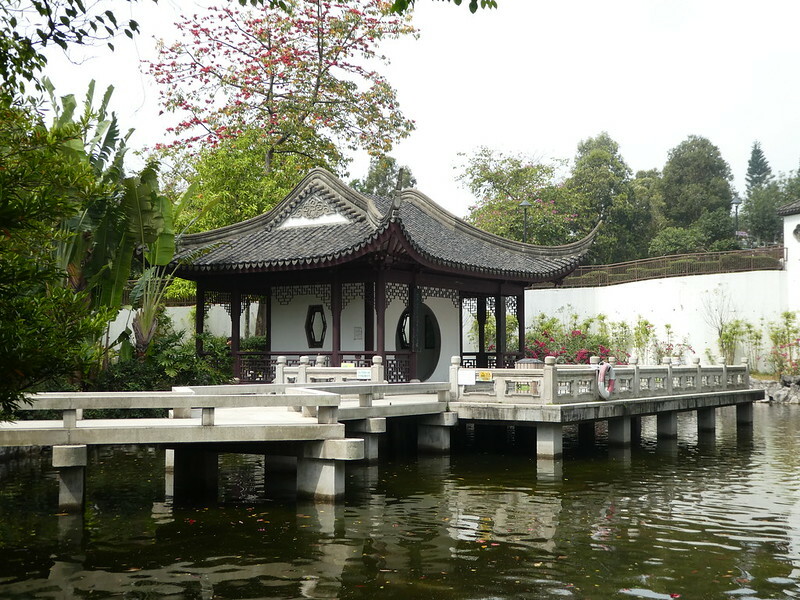 I visited the beautiful Nan Lian Gardens last year but it was just as nice strolling through them again. Although the Chi Lin Nunnery is connected via a bridge and Lotus Gardens, for some reason I hadn’t visited there before but I would strongly recommend it as the Nunnery is equally attractive, surrounded by ponds of gorgeous flowering water lilies. Before leaving Diamond Hill we stopped off for some lunch in a branch of Super Super and then spent the afternoon in the delightful town of Stanley in the south of the island which we accessed by MTR and then minibus. Stanley’s famous market is near the bus station so we wandered around there first but weren’t tempted into buying anything. 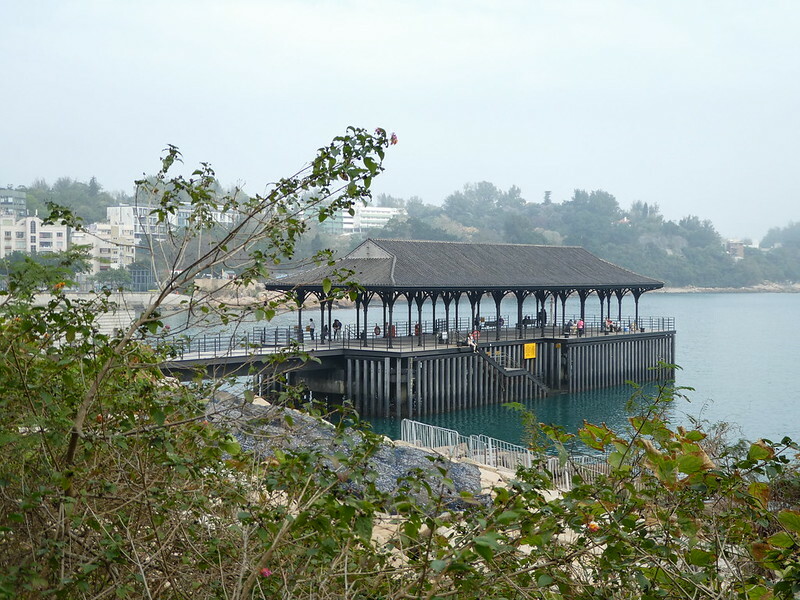 Next, followed a walk along the attractive seafront promenade to the picturesque, colonial Blake Pier and Murray House both of which were originally located in Central but were moved here in 2007. Further along the headland we visited the tiny Pak Tai temple and then followed a series of nature trails to a secluded beach and lookout point on top of the hillside. These boardwalk trails looked quite recent and I hadn’t been on them before but they provided us with a pleasant late afternoon stroll and some fine views coupled with useful information boards highlighting the key features. More cold drinks followed at one of the promenade cafes before returning to North Point by a direct bus which took about an hour at 6.00 p.m.
After yet another action packed day we needed to put our feet up for awhile but managed to get over to the Tsim Sha Tsui promenade for 8.00 p.m. just in time to view the Symphony of Lights show across Victoria Harbour, shows take place each evening. Despite the mist rolling in, we still enjoyed good views across the bay. 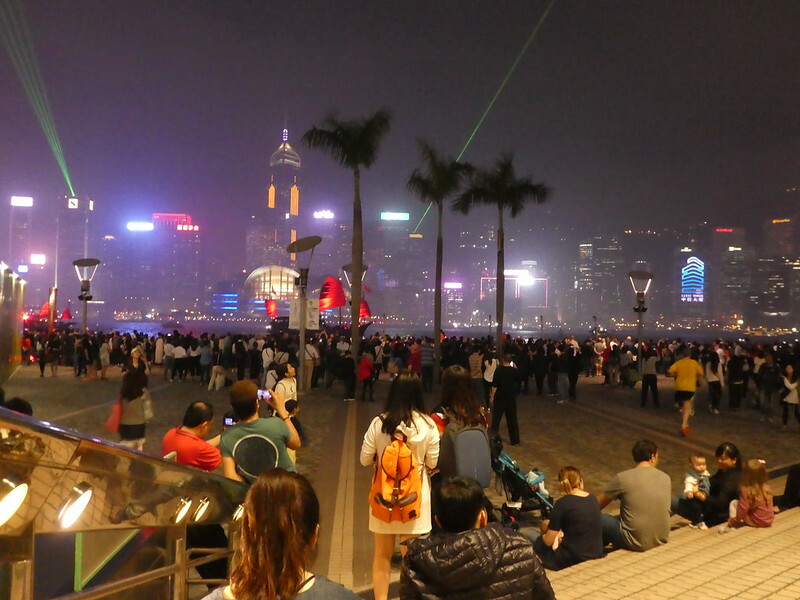 Knowing that the Star Ferry would be at its busiest when the laser and light show ended, we looked round the vast Harbour City Mall before returning to Central on a quieter ferry. 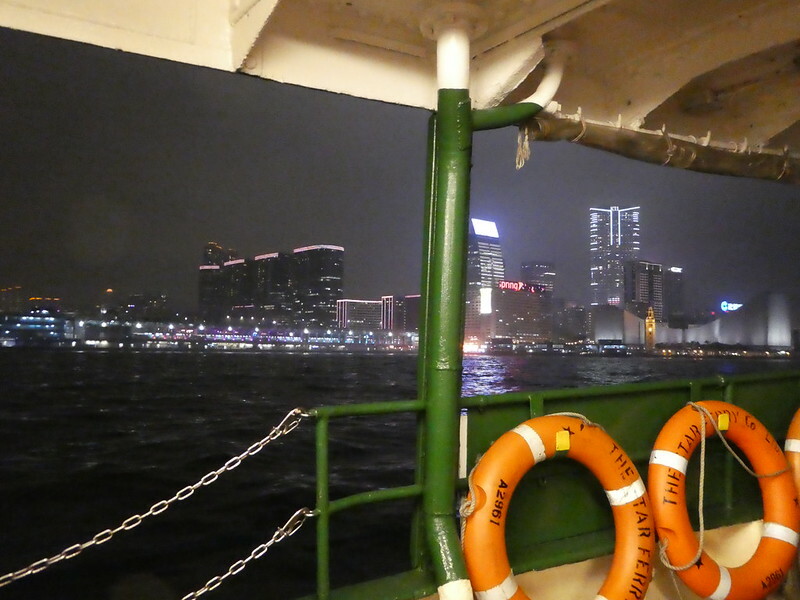 Do remember to sit on the left hand side of the boat when travelling from Tsim Sha Tsui to either Central or Wan Chai as the best photo opportunities are to be had from this side. This evening we chose to travel on the lower deck which is slightly cheaper but as it only costs about 25p on the upper deck, cost saving wasn’t the real reason. As I’ve mentioned previously, the lower deck is open whereas the upper deck has sliding windows, so taking photos is easier lower down. Returning to North Point by MTR we had not yet eaten so we opted for our favoured small restaurant where we had dined on the first night. This evening I selected pork with ginger and cashew nuts which tasted delicious, the soft tender pork with the crunchy cashews, a perfect combination. 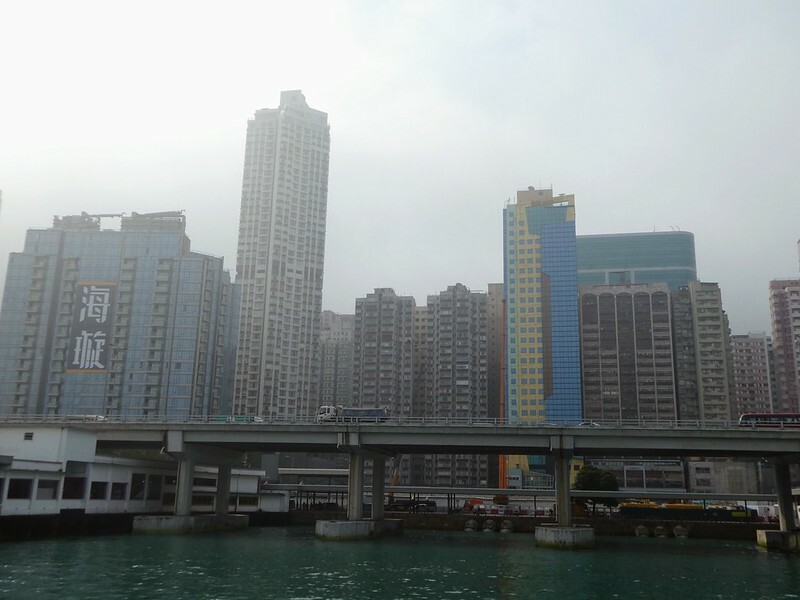 Your photos of Hong Kong make me want to go back (and I probably will)! Thank you Beatrice. I also love Hong Kong and would go back any time too! It’s amazing how, even in pictures, the traditional architecture such as the nunnery and the Kowloon gate impart such a feeling of peace. Thank you for such beautiful photos. Thank you Marie for your inspiring comments. I’m so pleased you are enjoying reading my posts. Fabulous post, already looking forward to your next one! Thank you so much for your inspiring comments Andrew. It’s so pleasing to read that you are enjoying reading my blog. What a wonderful thing to have every night with the Symphony of Lights. Looks fantastic. The Symphony of Lights were a real spectacle and absolutely free. Thank you for taking the time to read my posts on Hong Kong. There are many open, green spaces to get away from the hustle and bustle of the city and I hope I make get have persuaded you to consider visiting beautiful Hong Kong. Great day! I’ll add some of these places to my list of must do’s next time in HK. Have you toured Lantau? 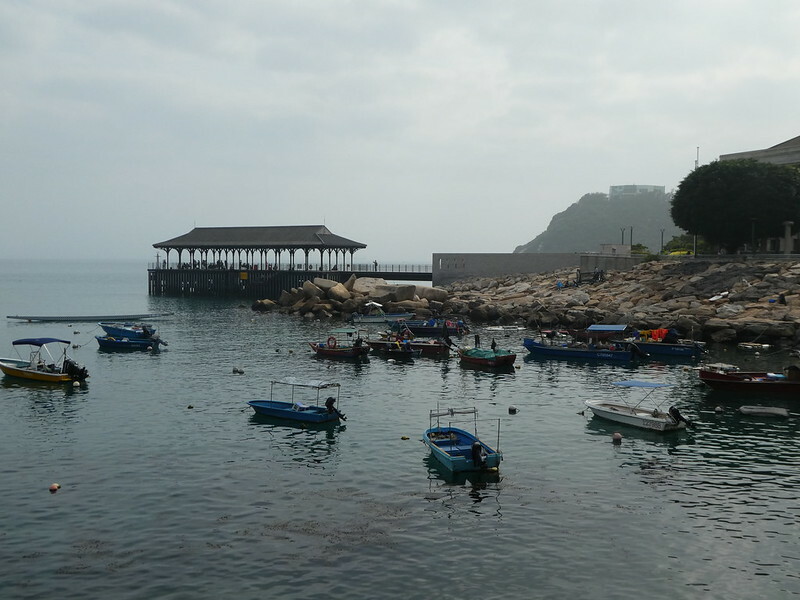 Amazing tiny fishing village there….seems like a whole different world to HK city. Safe travels…! Us, we’ve been to Lantau and lovely Tai O. Coming up! Thanks Suvi, I just love being in Asia! Thank you for your lovely comments. My tea was delicious and quite reasonable too! Nature trail boardwalk, Stanley, excellent capture and a big meaning in this click. Thank you for your kind words and for taking the time to comment. What a great day Marion. I had a wonderful lunch at the Nan Liam Gardens. It was a vegetarian restaurant. I loved the Kowloon Walled City. What a full and lovely day you had. Thanks Sue for your kind words. We certainly had a fun day, seeing and doing lots of nice things. Thank you so much for your kind words and especially for the compliments on my photos. Since I got my Lumix camera I’ve managed better night time shots with less camera shake. Hong Kong is so photogenic which also helps! Night time shots are tricky, but these ones look great! Thank you for reblogging this post. So familiar! 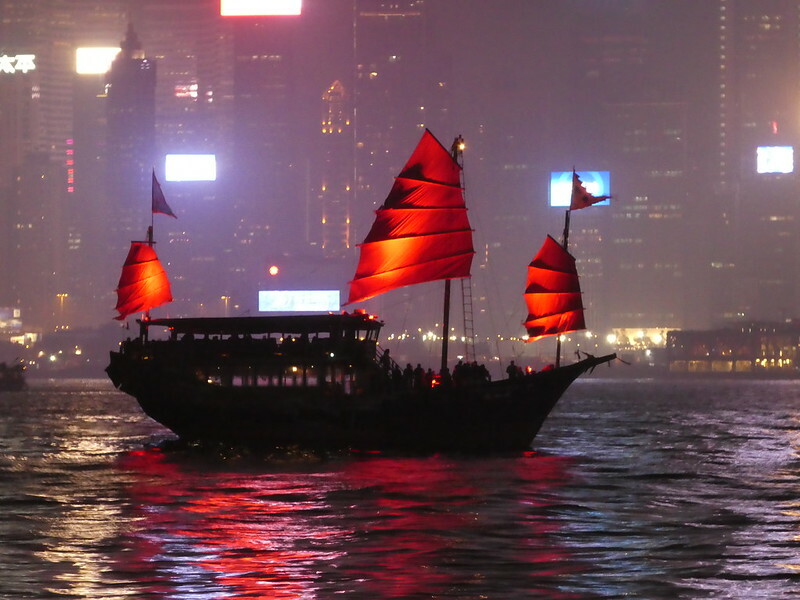 Hong Kong is in a constant state of change and motion but the underlying culture remains. The Scotch and Chinese breakfast mix was a bit of a surprise. I wasn’t expecting to have scotch pancakes for breakfast either! It’s pleasing to read that these post bring back memories of your time in HK. I love the picture of the junk – you should have it framed! Another fascinating day, you pack so much in and get to experience so many things, this is exactly what we love to do in a new place. The boardwalk trails look fun too. Thank you for your lovely comments Joy. It’s so nice to read that you enjoy doing the same sort of things too! I was pleased with the photo of the junk. The camera I’ve got now handles night shots much better and lessens camera shake. Do hope you are enjoying the Easter break and have got some chocolate eggs. Nice post, makes me wanna re-visit! Lots of places to add onto my list. Thanks Charlie’s for your kind words. Hope you get a chance to return soon. 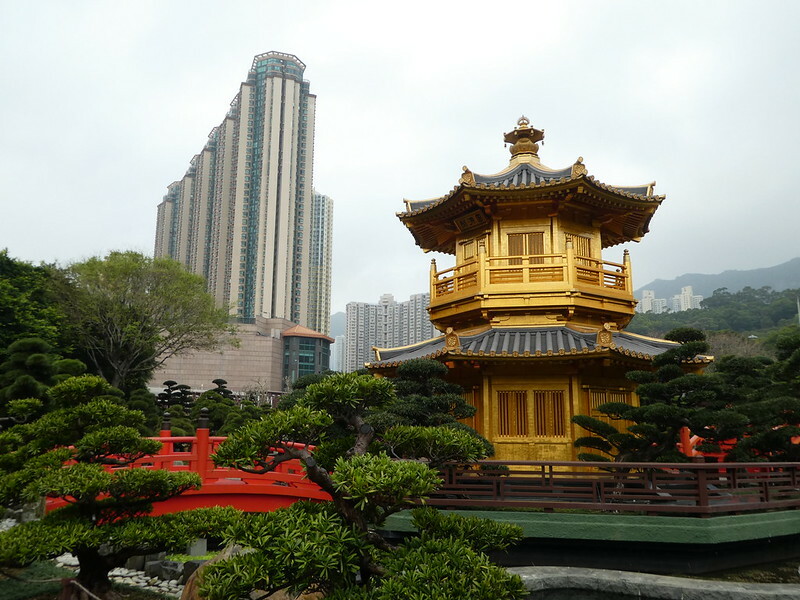 Nan Lian Gardens, Kowloon looks beyond fantastic! And the Symphony of light show too! Ah I just am transported seeing all this! Thank you so much for your kind words. Hong KongHong is so beautiful with many green spaces. Hope you are having a Happy Easter! You reminded me of my own trip to HK. I loved seeing it again through your lens. Thank you for taking the time to read this post and for your kind words. Sounds like a very fun filled, full day. I bet you slept good! Loved all of your pictures..the parks were fabulous – the temples amazing, the Junk was breathtaking. Thank you for your kind words. That junk looked beautiful as it sailed by. Thank you for your much appreciated thoughts on my post. I also like the blend of old and modern styles in Hong Kong. So many beautiful green spaces in the city! Exactly, so much green space – it’s quite unbelievable! Happy Easter! It certainly has changed…and with more beautiful places to sit & take it all in, & good to hear the charm of the Star Ferry remains. You’re very welcome. It’s a lovely post, with great images. Brought back happy memories. Thank you for your kind words and for reading my post. Takes me back! I was there many years ago. I love the hustle and bustle! Thank you so much for taking the time to read and comment on my blog, it’s much appreciated. Great entry 🙂 I love the pictures. It’s so beautiful in there, so much different than Vietnam. I hope I’ll have an opportunity to go visit Honk Kong with my wife one day :). Good luck on your travels! Thank you so much for taking the time to read my post and for your kind words. I’d also like to visit Vietnam one day ! Hi Marcus, Thanks for taking the time to read and comment on this post, it’s much appreciated. Aqua Luna is always a delight to see and I’m pleased with the results of using the Lumix at night with less blurring on the photos! M.
Glad to see you visit some special places. Thank you for your welcome thoughts and for reading my post.